Gastronorm dimensioning is used globally and indicates the outer dimension of the containers used in professional kitchens. The basic measure called GN-1/1 is 530 x 325 mm. 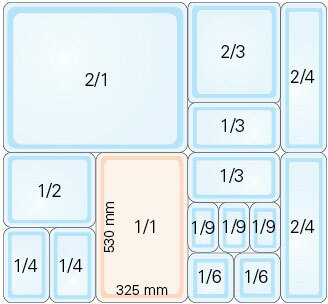 All container sizes are measured in relation to the basic measure. In addition the depth of the canteen is specified in millimeters. There is in literature a number of different ways to write about Gastronorm-dimensioning. The concepts GN containers and GN canteen are established in Finland and used in the daily work. The concepts GastroNorm, GASTRONORM and GASTRO-NORM are a more rare way of writing about Gastronorm dimensioning. Gastronorm standard provide canteens an outer dimension, but no exact mold for the corners and the outer sides. This is why containers made from different manufacturers differ from each other. Therefore do lids and containers not fit together and cannot be stacked if they are manufactured by different manufacturer. The volume also varies.